Mark your calendars: October 28 is Spay Day! It’s one of the busiest, as well as the most fulfilling, days of the year for us at the Cat Welfare Society: Spay Day! One of the society’s flagship programmes, Spay Day is an annual event that provides free sterilisation for community cats. It is an opportunity for everyone to make a difference for community cats throughout Singapore. We are thrilled to have international star Karen Mok as an ambassador for Spay Day 2011. Karen’s family has been rescuing abandoned cats for as long as she can remember. “We have adopted more than 15 cats over the years and they have always been a treasured part of our family,” she shares. Karen acknowledges that pet abandonment is one of the causes of breeding and growing stray cat—or community cat—populations. “Culling does not address the source of the issue. Only education on responsible pet ownership and sterilisation can effectively and sustainably control the community cat population in the long run and maintain community harmony. Why do we sterilise? To put it simply, to save feline lives. As Karen and BG (NS) Tan have said, sterilisation is an important aspect of cat welfare. Among community cats, it helps manage cat populations, thereby reducing complaints and the need for culling. It also has significant health benefits and decreases undesirable cat behaviours like caterwauling or spraying smelly urine. To find out more about sterilisation, click here. 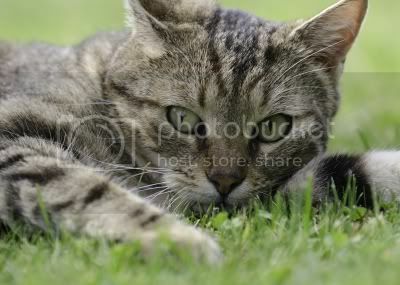 – Register your community cats for sterilisation. – Lend us cat traps and carriers. Find out more details at www.catwelfare.org/spayday2011. You can also email your enquiries to [email protected]. A rehabilitated tabby and a three-legged former house cat are just a couple of felines who found new homes through our ongoing adoption drive. The fortnightly cat adoption drive at Pet Safari branches, a partnership between CWS and Pet Lovers Foundation, was launched on September 4 and will continue until December 11. The inaugural drive at Vivo City got off to a roaring start, with people flocking to catch a glimpse of the cats before volunteers and fosters could even set up their cages. The “KTM cats,” formerly cared for by the staff of the now-defunct Tanjong Pagar Railway Station, made their first official public appearance. One of them was adopted just a couple of hours into the drive. Affectionately named “Daddy,” he now has a house instead of dusty rail tracks, and a family to call his own. Another successfully adopted cat, Eva, was a former house pet who fell out of a window because her irresponsible owner failed to mesh the windows. One of her legs had to be amputated but she has since learned to be completely mobile and independent. Eva is doing well at her new meshed-up, cat-friendly home. 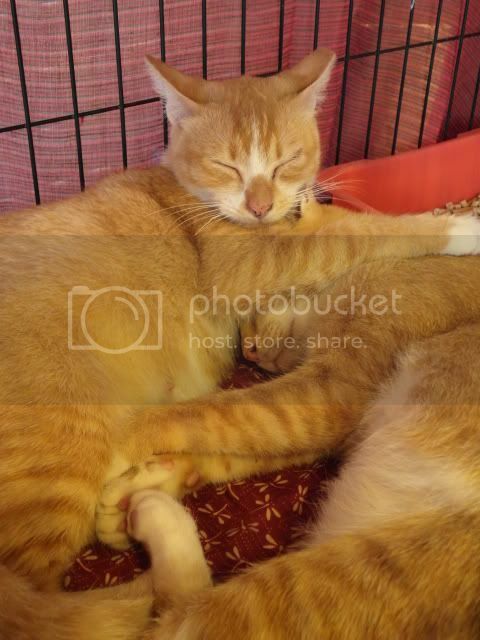 The second drive at Eastpoint Mall on 18 September was equally busy and several cats were rehomed, including more KTM cats. Some kittens rescued from a pest control trap found loving homes and counted themselves among the lucky ones. 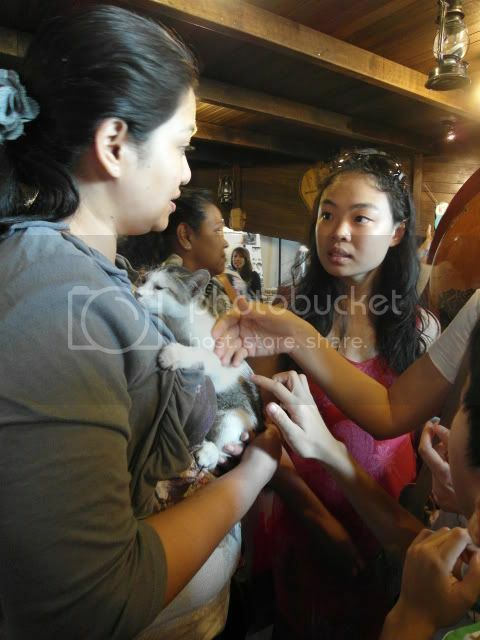 An unlicensed home breeder tried to capitalise on the adoption drive by bringing her home-bred cats to sell, but was escorted out as soon as the Pet Safari staff were alerted. Though distasteful, the incident reminds us how such breeding continues to undermine adoption efforts. Announcing the arrival of the CWS 2012 Calendar! Designed by the Brew Creative team, the calendar features many of our community cats in their natural environments, snapped by some of Singapore’s most talented cat photographers in various states of rest and play. And do you recognise that tabby on the cover? Yes, it’s Duke Orange, lending his ginger awesomeness to the CWS 2012 Calendar! Each month carries a different message on an aspect of cat welfare. We hope the calendar will prompt you to think a little more, care a little more, and do a little more for our feline friends. 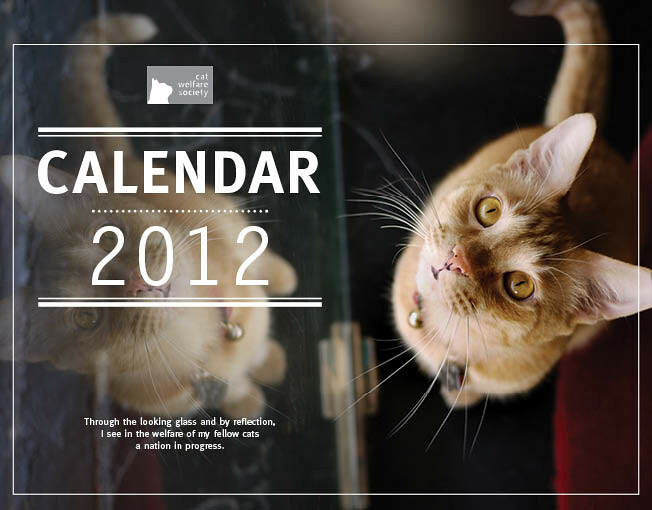 The CWS 2012 Calendar was made possible by the kind efforts of our sponsors and photographers. Selling at $10 each, it will be available at all our events, starting on October 16 (Cat Adoption Drive at Pet Safari VivoCity). Click here to find out more and to place your order now! Looking to get a cat? Give one of our rescued friends a forever home. Drop by our adoption drives, a partnership between CWS and Pet Lovers Foundation. See detailed schedule above. This year, we are aiming to sterilise 300 community cats and we can’t do this without your support! Your generous donations can save a feline life. For more information, click here. Swing by this annual roadshow and learn how to take good care of your pets. The family-friendly event includes talks and workshops, activities for kids, and booths of local animal welfare groups. 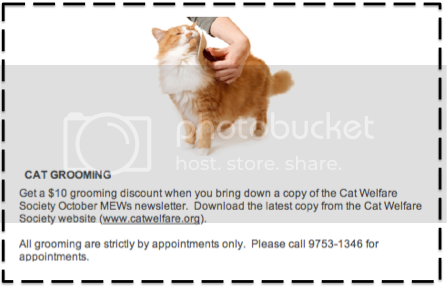 Get a $10 discount on grooming at Pet Zoom when you bring a copy of this issue of The Mews. 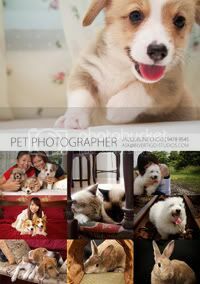 This holiday season, get 20% off beautiful Pet, ROM, Wedding & Family Photographs by Invertigo Studios in 3 easy steps. In the mood for some online shopping? Check out the feline-themed goods on Etsy.com, an e-marketplace for artsy, handmade, and vintage stuff. You’ll find treasures for yourself and for Kitty!.